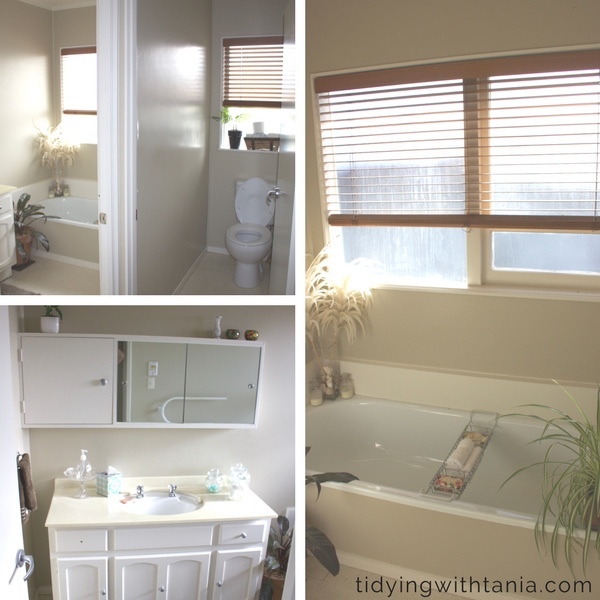 In my last post I revealed our beautiful new kitchen and now it's the bathroom's turn! It's fair to say that the bathroom renovations were probably the most dramatic change out of all the renovation work on the house. Unlike the kitchen which keep a similar foot print, our bathrooms were major changes, including structural. The ensuite was original, as in built in 1960 with the house, still had the original sink, tiles and taps...yep the the same taps and for the past 2 years I had no hot water. So you can imagine how freaking excited I was to finally get an ensuite that was actually built in the 21st century and had hot water. The guest bathroom was tiny and had no shower just a bath and the toilet was in a separate room. The day I came home to the renovations to see the ugly old shower and taps in the skip was a great day, I tell you, I jumped for joy. So with out further ado here is the low down on the bathroom renovations. Let's start with the before and afters. We also wanted the bathrooms to match, so this meant getting two of everything. This was actually helpful when it came to cost and decision making. Anything to reduce the amount of decisions we had to make was a relief. It was not difficult working out the plans for the bathrooms as the shape and size really dictated what was able to be done. The ensuite was straight forward. Wall to wall shower to go where the wardrobe was, sink in the same place and the toilet where the old shower was. Some of you may be thinking! what do you mean by a wardrobe in the ensuite? Ok so let me tell you about our lovely original ensuite. The house was built in 1960 and the owners had 5 children so they built a bathroom for the master bedroom. It must have been very fancy in 1960 as not many homes in New Zealand would have had an ensuite. Now for some reason a double wardrobe was actually built into the ensuite (see image above). 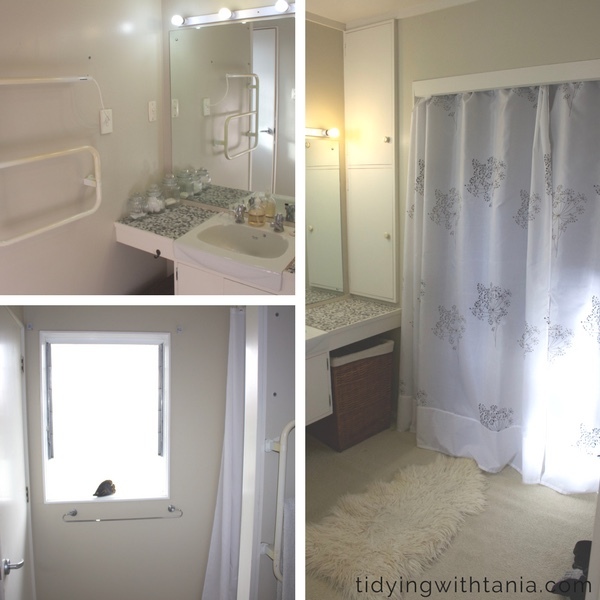 We actually removed the wooden wardrobe doors and put up shower curtains as this helped reduce the moisture from the shower onto the clothes. Getting rid of the wardrobe from the ensuite was fundamental and so provided a large space that was perfect for the wall to wall shower. 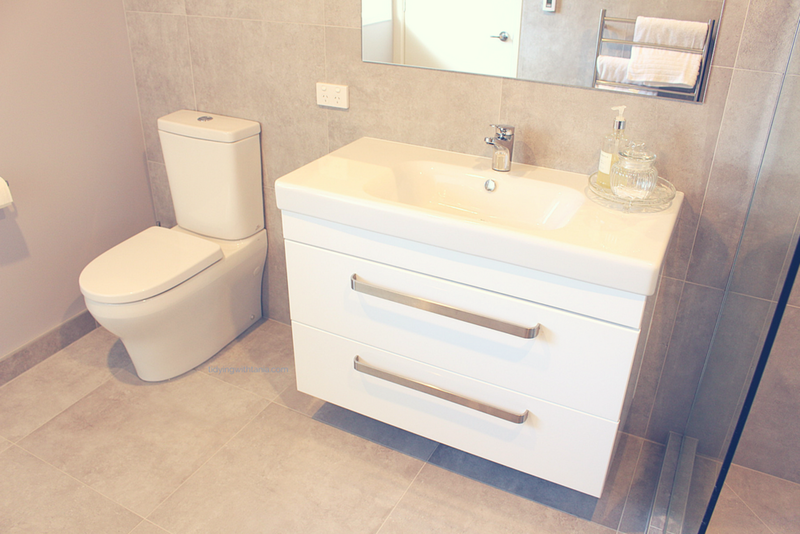 And as the ensuite had no existing toilet it made sense to ensure that we could get one installed. 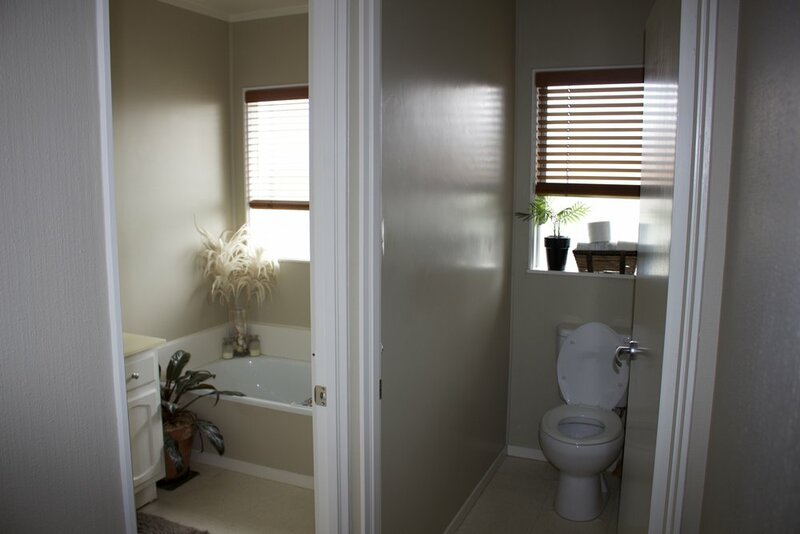 The actual layout of the guest bathroom was going to be totally different as we were creating one large bathroom from two very small rooms being the old bathroom itself and the toilet room. As with the kitchen, the renovation on these rooms was full on, everything was ripped out, even the ceiling. We were dealing with original 1960 bathrooms so we have to start from scratch, nothing was worth saving nor up to current building code. I remember at one stage in the renovation you could see up into the roof and down into the basement!! Pete and I found this part of the renovation very interesting as you really got to see the amount of work that goes into "building" these rooms. All the wall linings, insulation, ceiling lining and flooring had to be wet area grade and because we were having floor to ceiling tiles there were even more sealing requirements. 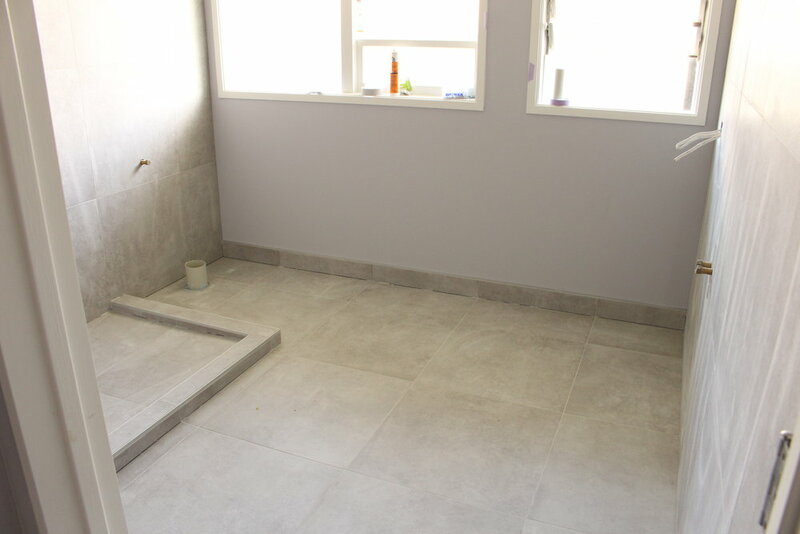 The tiled shower area had a grey cement base laid and then a blue rubber like paint. There were a few issues with the bathrooms however nothing that couldn't be worked through. The main one was the layout of the guest bathroom. 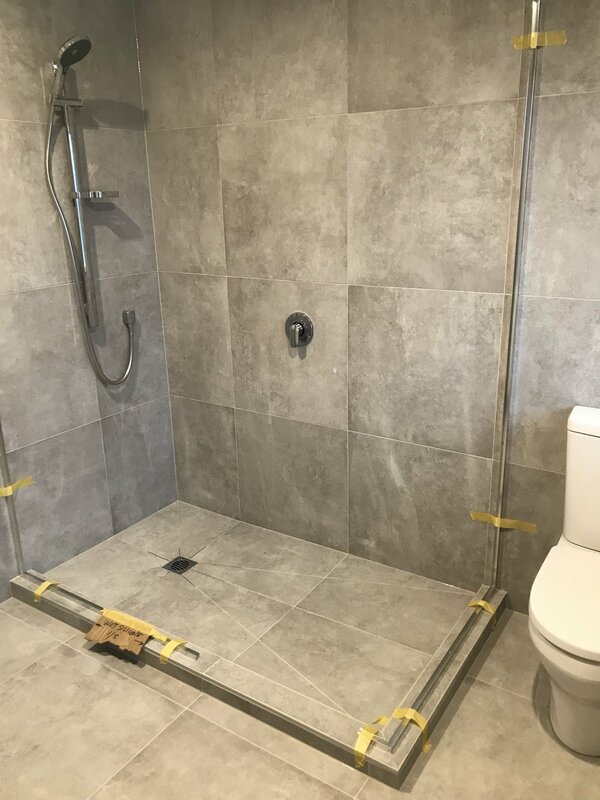 The original plan was to retain the small wall to the right as you came into the bathroom and the wall to wall shower would go in there, also the toliet would be straight ahead of you as you walk in the room and the sink on the side wall facing the ensuite. The plan on paper seemed to work and we would not have to change too much of the external and internal plumbing. However once the builder got to work in the guest bathroom, he was not happy with the proposed layout. Our builder has done a lot of bathrooms and they are his speciality so he has built up a good design eye over the years. 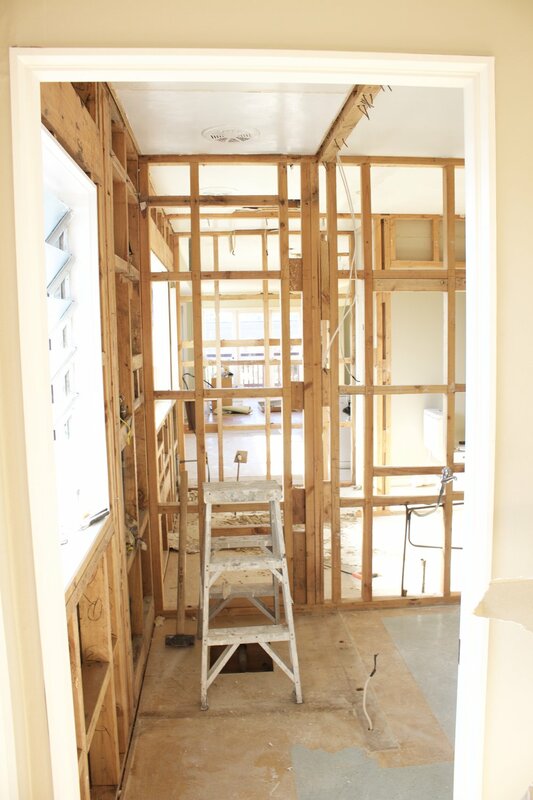 He felt retaining the small wall would make the bathroom feel small and enclosed, so he suggested removing the wall altogether and bringing the door back out in line with the hallway. Then the shower and the toilet can go along the side wall (ensuite side) and the cabinet on the kitchen side wall. It was actually a much better idea than our plan as it really helped to create the simple, light and open bathroom we wanted. And he could do it all without a variation cost, as all the plumbing and electrical was being replaced and costed into the total budget. win all round I say. So apart from that change everything else stayed as planned. During the renovation Pete and I took advantage of having all the walls exposed and insulated "everything" , walls, floors and ceiling. It was a great opportunity and certainly took up a few evenings but totally worth it. I have to say I really notice the difference this winter. Overall we did well with the costs of the bathrooms as there were a few bargains that we picked up on the way. Interestingly enough the cabinets were discounted by 60%, however we got them firstly because we loved the style, the discount was a bonus. However we noticed once the vanity was installed that you could see washer marks on the front where the handles fit in. They were not that noticeable at first however once I saw them it was like.....that's all I saw!. Our builder encouraged us to go back the shop where we brought them, Placemakers, and explain and show them the damage. They were very good and got the supply company, Newtech to contact Pete and I. They advised the 60% discount was done because of this known issue. Unfortunately when we purchased them we were not advised that they were discounted for any particular reason. So word of warning, always check if the discounting is due to damage or product fault. In the end they sourced replacement fronts for the cabinets and it did not cost us anything which we did appreciate. Not only did we get a great deal on the toilets and vanities, we also took advantage of the big annual sale at Elite Bathroomware . Pete and I have always liked Methven tapware however it is not the cheapest around, but the quality is great. So fortunately all the Methven products were on special and we got all the tapware for both bathrooms for $2100. I have listed below most of the products with relevant links so you can get more details about them. Waking up, stepping into a big, light, spacious bathroom which is warm under foot is a total luxury. The size of the shower still takes getting used to from our little box of a shower that we had. And lets not forget that I don't have to leg it down the hallway to the bathroom in the middle of the night! Bathroom of my dreams? pretty damn close really! I am still accessorising both bathrooms as I like to take my time on this and get it right and not rush and buy a whole lot of stuff to "dress it up" . 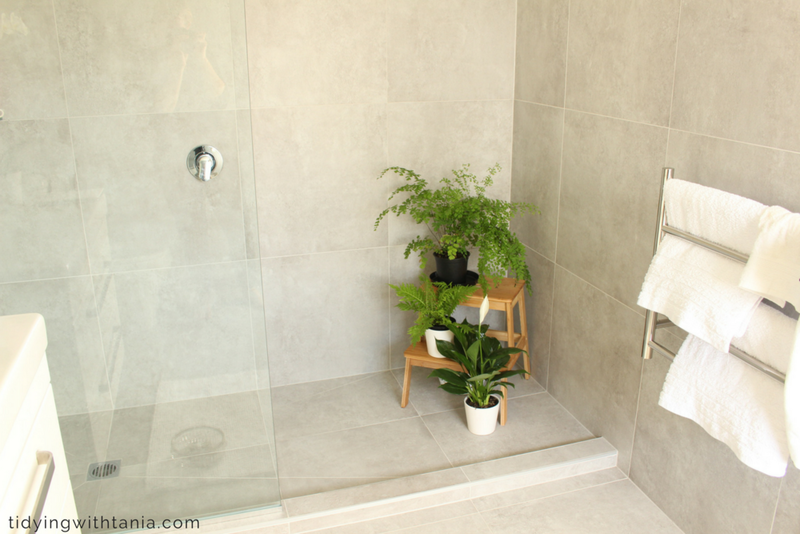 I have put some plants in the bathroom as I love a bit of green to soften the view and feel and they are great air filters! The other item we are yet to get up is the window treatment. We will put up roller blinds in the windows, however as the windows are already frosted it's not really urgent. One of things I really love is the finish and quality of the tiling. Our builder uses the same tiler and he is excellent, just a young guy and boy does he work hard. It's the way he finishes the edges and the grouting that really shows his workmanship. So what do you think? is it an improvement? yip I agree it is!. Don't forget to follow me on my social media , lots of fun and interesting things happening.